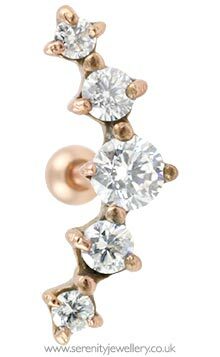 Rose gold plated sterling silver or surgical steel 16mm high design with one 3.5mm, two 2.5mm and two 2mm prong-set crystals on a surgical steel 6mm or 8mm bar with 3mm screw-on ball closure secured at the back of the ear. The thicker part at the top of the post/base of the setting means it sits about 1.5mm away from the ear rather than against the skin. 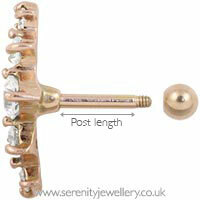 You can see this in the second photo showing the side view of the earring. I haven't taken it out since wearing this. I even find it comfortable enough to sleep in which I was a little concerned about. 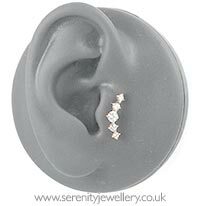 I wish it was made in a smaller gauge as I have very thin cartilage and would like my jewellery worn a little more fitted, but no issues with the product itself.